The aim of DalSpace is to showcase and preserve Dalhousie’s unique intellectual output by making content freely available to anyone, anywhere via the web. 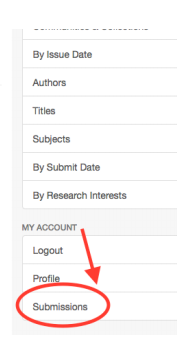 We strongly encourage faculty to deposit their research into DalsSpace whenever possible. While DalSpace has it’s own collection guidelines, each community can make arrangements to establish its own collection policy. If you would like to explore other policy options, these can be established with input from the community. Communities may contain Sub-Communities and Collections to reflect the structure of the unit and the nature of research conducted. Repository submissions and content management may be carried out at individual (submitter), Collection, Sub-Community or Community levels. In the absence of a Community/Collection administration, content is managed by DalSpace staff. Collection workflow can be set up, where a person or several people review and accept or reject items submitted to the collection before they become accessible. DalSpace may include materials that may not make it into a journal: conference presentations, preprints, working papers, learning objects (course notes, etc. ), white papers, theses and dissertations, special collections (such as unique musical scores and 19th century photographs). When depositing an item to DalSpace, the author or contributor should confirm that they are the rights holder or have the permission from the rights holder to deposit the item. Journal articles: if the publisher holds the rights to the article, you will need to confirm the publisher’s policy with regard to depositing an article in an institutional repository. A growing number of publishers allow authors to deposit pre-prints (manuscripts that have yet to undergo peer review) or post-print (peer reviewed) versions of their article into an institutional repository. It is also possible to write directly to the publisher for permission. For conferences, it is best to contact the publisher of the conference proceedings directly. 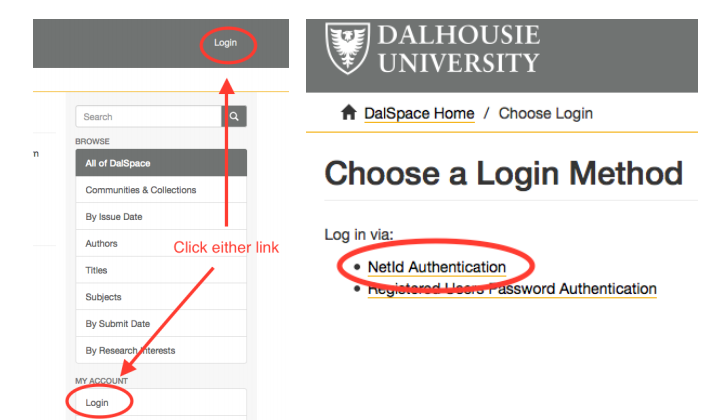 Getting Started: Once you have been added to a Collection, go to DalSpace and Login with your Dalhousie NetID. Select “Submissions” under My Account. Start a new submission by clicking on the link provided. The repository is meant for finished material, not works in progress. At the same time, we know “revisions happen,” and can make sure the most up-to-date version of your work is available in DalSpace. You can’t edit a document once deposited. If you revise a paper you deposited, or want to add an addendum, send the new material to the DalSpace administrator, with a note explaining what you want done. Administrators are the only people allowed to remove documents from the site. Removal: the item will be completely expunged from the database and cannot be reinstated without re-submitting it. Withdrawal: the item will not be visible, and search engines will be blocked from detecting it, but the item will actually continue to exist in the repository. An Administrator would be able to reinstate it. Tombstones. When an item is Withdrawn or Removed, a “tombstone” is left in its place. A scholar who linked to an item in DalSpace will never be faced with a broken link. If someone should enter the item’s URL (or “handle”, in repository parlance), they will get a message that gives a reason why the item is no longer available, and the email for the DalSpace administrators. When your submission is complete, a permanent Handle is automatically assigned to your work by DalSpace. This Handle is listed as the URI on your item page. Use this Handle when citing your work. Do not use the URL that appears in the location bar of your web browser. If you require a Digital Object Identifier (DOI) for your submitted work please contact dalspace@dal.ca and make the request. We will then assign a DOI and register it with CrossRef.. If you can upload it, you can put it in DalSpace. Any kind of digital material in DalSpace, including data files, images and multimedia formats can be uploaded. Almost all types of formats can be submitted. Accessibility, however, is dependent on the software available to the researcher. At this time, the Library does not have the resources to guarantee that file formats will remain accessible. Using common, popular file formats will help. Web pages with no other linking pages can be submitted as a single file. When submitting a multi-page web site, you will have to indicate which file is the main or home page. Current policy requires all the linked pages of a web site to be part of the DalSpace submission to guarantee continued access to the whole web site. In addition, all links to web pages included in the submission must be "relative links." A "relative link" is the name of the linked file (e.g. test.jpg) as opposed to a full link (e.g. http://libraries.dal.ca/images/test.jpg). DalSpace software assumes that all web pages are located at the same DalSpace "address". You may have to adjust the links in your web pages before submitting them.